The high-profile killing was everything one could want from a public assassination. Cameras were live; the Western media, less prone to state censorship, watching. The assassin even had a chance to deliver a short speech that was straight to the point, and then was promptly killed by Turkish security services. From the standpoint of political murder, it ticked all the boxes. It goes to show that humanity has made a good leap forward in education that #FranzFerdinand briefly trended on Twitter. That people knew of the long-dead Archduke, and knew his killing touched off World War I, is a testament that maybe teachers are doing a good job after all. Well, a decent job. Because the killing of Ambassador Karlov is a blip, not a world-shaking event. There’s a very good reason for it: Russia needs Turkey more than Turkey needs Russia, and so even if Putin’s own mother was killed in Ankara by a similar rogue agent, Moscow would still very likely not go to war with Turkey. That’s because Franz Ferdinand tripped a geopolitical bomb waiting to go off. There is no such bomb between Turkey and Russia. Single events don’t shape geopolitics; geopolitics define events. That’s an important principle. You can set off a bomb in the American Congress, but you won’t start a war unless the U.S. is already primed for one. This is a common – and rather fair – accusation of September 11th. It gave the U.S. the excuse to reorder the entire Middle East, something it had wanted to do since the end of the Cold War. Having reordered Europe on its terms, America wanted to do the same thing to the energy-rich, geographically strategic Middle East. For a superpower, it made all the sense in the world. But rallying the public was no easy feat: small bombings like the USS Cole in 2001 brought small retaliations. The scale and scope of 9/11 gave American elites the political capital they needed to do what they’d been mumbling about all along. You know this very well in your own near terms: when two friends are ready to have a falling out, any particular misdemeanor can trigger one or the other. It is not the small thing that ends the relationship, but a series of small things that led up to a giant event. 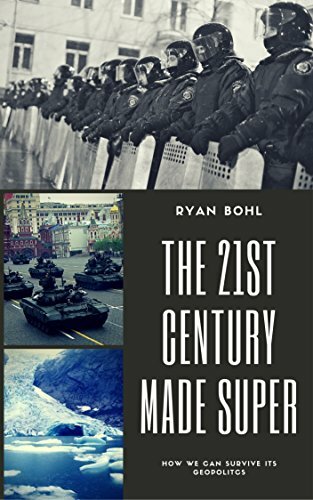 And so events like revolutions, civil wars, and interstate wars never begin because of a single event, but a series of them, reinforced by increasingly powerful geopolitical factors. In 1913, Austria-Hungary’s elites had plenty of incentive to expand into the Balkan states, so recently freed from their 400 year-old-arch-rival, Ottoman Turkey. Bosnia had already fallen; Serbia was the next geographic step. Each Balkan state under Vienna’s rule made the Hapsburgs more secure from the Turkish threat. But naked aggression would not rally the empire’s many peoples to war; they would, rightly, see an invasion of Serbia as nothing more than an elite power grab slick with their blood. So instead, they waited for an event that would reduce the geopolitical considerations of Austria-Hungary to personal ones. Since most subjects and citizens don’t consider geopolitics, the empire’s elites needed something visceral and personal to convince their people that war and occupation of Serbia was necessary. The assassination, killing an unarmed royal family member, did just the job, hitting the right emotional notes needed to rally the empire’s people to a war they would otherwise not support. But it did not invent Hapsburg desire to invade and control Serbia. It just gave an excuse. So why won’t Russia use this as a means to expand? In a word: NATO, which Turkey still embraces. Recep Erdogan, Turkey’s authoritarian president, has shown no inclination he wants to abandon the alliance: he knows full well that to do so without a new alliance to back him up would expose Turkey to unwanted outside pressure. There are other good reasons as well, though. Russia as the USSR once dreamed of a Communist Turkey, which would have guaranteed Soviet access to the Medittearnea Sea and given it a powerful springboard into the Middle East. But Russia today has no ideological weapon to overpower Erdogan from within: its neo-imperial nationalism only works for fellow Russians. Even if Turkey were outside NATO, straight up occupying Turkey would be far too expensive for modern Russia. With a rising Turkish nationalism of competing ideological stripes, that would be foolhardy in the extreme. Rather, Russia needs Turkey to help it find some kind of solution to Syria. Russia now owns the Syrian civil war in a big way: having helped conquer Aleppo, it must now commit to finishing the job. It doesn’t want to repeat the mistakes of the Americans in Iraq, wasting time and power on nation-building; it just wants its ally, Bashar al-Assad, to be the most powerful faction in the country. That is impossible unless Turkey cooperates. Turkey has the largest army besides the U.S. in NATO: nearly half a million active troops, kitted out with U.S. gear. If Turkey wants to wage a proxy war in Syria, it has ample ability. Of course, Turkey already is: it has an undetermined number of troops in Syria right now, clustered around the northern Syrian town of al-Bab. It launched a proper invasion in this August to split Kurdish forces in half: they were close to establishing complete control of the Syrian border with Turkey. Turkey also fleetingly battled the Islamic State, whose incessant bombings in Turkey only underscore the notion that states will endure a great deal of abuse from enemies they don’t consider geopolitically priorities. Russia has deployed more power to Syria than Turkey, and probably could, in an outright fight, push back or defeat Turkey’s forces. But that is a direct Russo-NATO conflict, so it’s completely off the table. Instead, Moscow has to find clever ways to convince Ankara that it will not be threatened should Assad rule Syria again. They have some leverage. To solidify his own power base, Erdogan threw away a peace deal with Kurdish militants last summer within Turkey itself. The Kurdistan Workers’ Party, or PKK in Kurdish, were once Soviet-supported communists. They no longer enjoy that kind of backing, but they are powerful, and become more so when Kurdish enclaves in Iraq and Syria are well-situated. Turkey has long hated Iraqi Kurdistan, which is a functioning statelet that hosts from PKK camps; it does not want a second front in Syria. The problem for Erdogan is that the United States sees the Kurds, at least for now, as the least bad, most useful faction in the Syrian Civil War. Russia has little opinion on the matter, and Assad’s government has something of a truce with Kurdish factions in both Aleppo, where Kurdish “People’s Protection Units” have been allowed to survive Assad’s murderous onslaught, and in Qamishli, a Syrian town in the far northeast where a surviving Assadist enclave remains surrounded by Kurdish forces. These truces make sense only in light of how depleted Assad’s army is, and how little force Russia really wants to deploy to the country. With the fall of Aleppo, Russia and Assad can be more open to putting pressure on the Kurds; such a thing would please Erdogan. Still, until not long ago, Turkey was the main conduit for Islamic State recruits and weapons: implacable anti-Assadists, they must be eradicated for Moscow to claim anything like a victory in Syria. For all the trouble Russia might cause by helping Assad ignore Syria’s Kurds, Turkey can readily become a gigantic rebel base camp yet again, causing a long-running war akin to Colombia’s struggle with the FARC. Except ordinary Turks are not cleanly supporting Erdogan. To gain Russian support against Kurdish factions, and to presumably reduce bloodshed in Syria itself while claiming leadership over the crisis from the feckless United States, Erdogan must also play ball with Moscow. That serves his purposes: challenging Western power to restore Turkish prestige without undermining NATO itself, gaining leverage over Kurdish secessionists, and establishing a claim to leadership in the Arab Sunni world. But not all Turks like the way he’s going about it. Some Turks have long feared Erdogan sought a false flag attack on Turkey itself in order to invade Syria and begin restoring the Ottoman Empire; typically, these were anti-Erdogan secular Kemalists, whose Turkish nationalism restricted their ambitions very cleanly to Turkey itself. But as such attacks came and went without invasion, such fears have faded. Other Turks are infuriated at the butchering in Aleppo at the hands of Russian and Syrian forces. Presumably, this is what motivated the assassin (though his being an agent of a wider movement can hardly be ruled out). Many of these are the Islamist rivals to Erdogan’s ruling Justice and Development Party (AKP in Turkish), especially those who make up the harried but still formidable Gullenist movement. The Gullenists, once allies to the AKP but later having a fallout over rival ambitions, also want to return Turkey to the leader of Sunni Islam, but want it done under their helm, rather than Erdogan’s. Their accusation against Erdogan is that he isn’t doing enough to save Sunni Arabs in Syria from Assad’s butchers; their jostling can upset the Turkish applecart in a way that might throw off Russia’s plans. It’s still a long way until the next general Turkish election: 2019 now. But as the failed coup over the summer showed, Turkish politics is not always paced by electoral calendars. Turkish politics by other means. Well, a peace deal, for one, is in the offing. Turkey, Iran, and Russia recently announced a peace deal to begin to end the civil war: Assad will be left in power, and the U.S. will have nary a say in anything, having abrogated a seat at the table by refusing to commit more power to the war. That doesn’t mean the civil war is over: Saudi Arabia and the Gulf states, supplied by a Trump administration, may well try to pick up the slack, and the incoming Trump administration has made it clear it will try to roll back any growth in Iranian influence in the Middle East. Recent terrorist attacks in Germany may rally Europe behind a renewed push to settle Syria on Western terms. That’s presuming domestic Turkish politics don’t push Erdogan into a harder line against Assad: anti-Russian, anti-Assadist protests are now a regular feature of the Turkish street. The budding friendship between Moscow and Ankara, in other words, may not make it 2018. Previous Previous post: Aleppo has fallen. Now what?